The need to get firewood from a draw below my house to my woodshed started me on what became a fun project. After felling 4- to 8-inch diameter standing dead oaks, I could have cut them into four-foot lengths and pulled them uphill in my cart, but the uphill was a bit much. Another alternative was to clear a four-wheel drive road down into the draw, but that would have created an ugly swath and repeated trips of my pickup would have made unsightly ruts in the ground. Yet another interesting alternative was winching, or yarding, these pole-size, 15- to 20-foot tall trees uphill. That’s what I decided to build. A yarder is a device that uses an overhead cable, some pulleys, and a tow rope or main-line rope to move the logs up the hill. If only one end of the logs could be suspended above the ground, the only impact to the ground would be drag marks of the tail end as they’re being yarded uphill. I didn’t have ta skyhook to lift one end of the poles, but other supplies were readily available. Spools (empty electrical wire spools made of wood) to wind rope on for yarding were available at hardware stores for only a few dollars. I also needed a motor to turn the spool and some sort of gear to connect the motor to the spool, but I didn’t think I had such a thing. Then I remembered my old front-tine rototiller that had been replaced by a new rear-tine tiller. The old tiller, idle or not, did have a worm gear, which could transfer the speed and power of a motor to a spool. After the old tiller was stripped down to motor, worm gear housing and tines, it was obvious that a spool could most conveniently be bolted to the tines on one side of the housing. The tines on the other side, while seeming to be excess baggage, actually led to a neat discovery. Inside the large diameter tubes on each side are two smaller diameter tubes bolted to the larger tubes. Figure A: Two large diameter tubes, that were once pinned to a solid worm-driven shaft on opposite sides of the worm gear housing of an front-tine rototiller, have the curved ends of the tines removed before being bolted to the sides of the spool. Removing the bolt that connected the large and small tubes together and seeing the two tubes turn freely from one another is what gave me the idea: I could use the small-diameter tube, which has the same outside diameter as the solid worm-driven shaft, as a stabilizer or bearing shaft that would fit inside the large-diameter tube on the side of the spool that wasn’t going to be pinned to the solid worm-driven shaft. This would stabilize the spool on the non-driven side (the side away from the motor). Only one small-diameter tube was needed, so the other one was truly excess baggage. Of the three tubes needed (two large-diameter tubes and one small-diameter tube), the curved ends of the tines were cut off so as not to catch on anything, and holes for bolts were drilled near the end of the shortened ends. 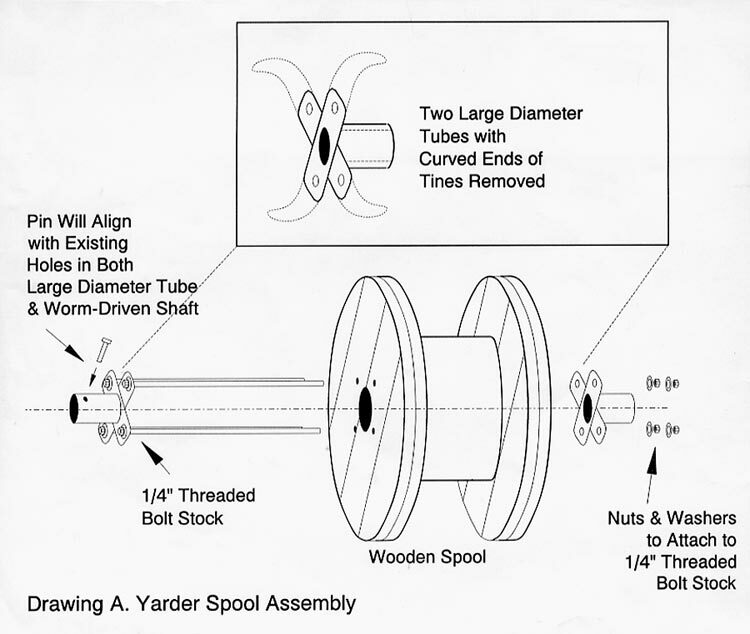 After completing the spool assembly, as shown in Figure A, by threading ¼-inch bolt stock long enough to reach through the width of the spool and hold the two large-diameter tubes to the sides of the spool, the next step was to decide to which side of the worm gear housing the spool would be pinned. Because the idler pulley (which causes friction from the belt in the groove of the pulley on the motor to the pulley on the worm gear) was on the left side, the spool was pinned on the left side so the operator could stand on the left side of the housing to engage the idler pulley. As shown in Figure B, with the left side of the spool pinned to the solid worm-driven shaft and with the right side with the small-diameter tube spinning freely (with a little oil) inside the large-diameter tube, the next step was to build a frame to hold not only the worm gear housing but the small-diameter tube on the outside. In building the frame, stacking seven 2x4s on top one another gained enough height to get the side of the spool pinned to the solid worm-driven shaft off the ground, and another pile of seven 2x4s plus a short 2×4 and 4×4 for lag bolting the shortened tines of the small-diameter tube got that side off the ground. Then long bolts from a discarded telephone pole not only held the two stacks of 2x4s together but held 2×4 cross members that kept the proper distance for the spool assembly to fit between solid worm-driven shaft and small-diameter tube. Since a pin connects the large diameter tube of the pulley to the drive mechanism of the rototiller, pin-in allows for retrieval of logs. With no pin installed, both large-diameter tubes bolted to the sides of the spool turn freely on both solid worm-driven shaft and small-diameter tube, and rope on the spool can be unwound, pulled down into the draw and tied to logs ready to be yarded uphill. With the old V-belt in the grooves of both the pulley on the motor and the pulley on the worm gear housing, the old idler pulley had to have a different hookup because the old tiller’s handlebar with idler pulley pull-wire had been removed. An old axe handle bolted directly to the idler pulley bracket became the operating control. It would also telegraph important vibrations to my hand when poles were being yarded uphill and, more importantly, lowering this handle by only an inch or so from its horizontal operating position would stop yarding operations in an instant. As for the skyhook to lift one end of the poles off the ground, a steel skyline was needed. Steel has the durability to handle the abrasion of a block—or carriage—running on it while lifting the end of poles off the ground. The 1/8-inch cable selected only cost 15 cents a foot for the 450 feet needed to reach across the draw. The cable had a working load (the weight it can carry) of 500 pounds after all of the stresses (such as, but not limited to, the tension on the cable to pull it up in the sky) are subtracted from the cable’s one-ton breaking strength. 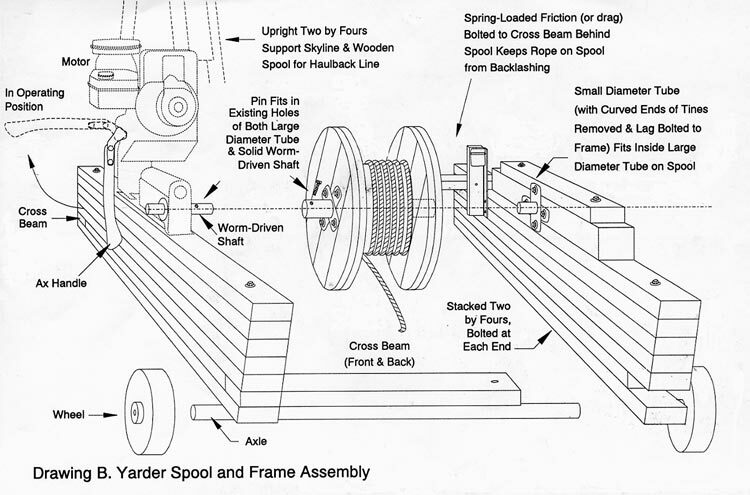 Figure B: With the left side spool assembly pinned to solid worm-driven shaft and with small-diameter tube spinningfreely inside the large-diameter shaft on the right side, building a frame is simply stacking 2×4’s on top of one another, placing cross members, and bolting it all into place. At the back of the yarder, a mast (or tower) to elevate the skyline is simply constructed with 2x4s and a bolt to hold an old wheel (which once turned the drum of an old cement mixer). The wheels off the old cement mixer were also put to use underneath the front of the yarder so it could be wheeled to several yarding sites needed along the rim of the draw to yard the logs uphill. Moving the yarder to a new site is fairly easy. The rope on the spool is fed through a block (a pulley set in a casing) tied to a steel rod driven in the ground at the next yarding site and then back to the front of the yarder. Once the motor is started, the spool pulls in rope which yards the yarder itself (with operator walking excitedly alongside) to its new site. The back of the yarder simply slides on two skids, wooden blocks covered with curved steel plates from a discarded telephone pole to reduce friction with the ground. At a new yarding site, after using cable clamps to tail-hold or anchor the end of the steel cable to a tree on the other side of the draw, the hand-turned winch on the mast (or a block and tackle attached to a rod driven in the ground behind the yarder works as well) pulls the cable up in the sky. A steel rod through a bracket at the back of the yarder and into the ground keeps it from being yarded downhill when poles are being dragged up. To stabilize the top of the mast, guy wires are fastened to the bolt holding the old cement mixer wheel and extended to steel rods driven in the ground behind the yarder. How the yarder works is also simple. First the pin is installed to connect the worm-driven shaft to the spool. Then the motor is started and the idler pulley causes enough friction on the V-belt to make the pulley on the motor turn the pulley on the back of the worm gear and cause the spool to start reeling in rope. Because the rope is connected to the skyhook beneath the cable block it will try to move the cable block back to the yarder. But first it picks up the slack in the line which includes raising the front end of the logs which are tied into the line through the ground block. With the weight of the end of the logs on the hanging block, ground block, and carabiner, the pulling force from the yarder on the carabiner causes the carriage to be pulled along the cable toward the yarder. At almost the same moment, though sometimes delayed a bit, the friction of the end of the poles dragging on the ground causes equalizing forces on both hanging block and ground block to lift the poles farther off the ground. Eventually, the ground block will be pulled up close to hanging block and carabiner, and then the carriage will be coming speedily toward the yarder with several poles in tow. Getting the choker back down into the draw can be accomplished by either a “go-for-it show” or a “haul-back system.” In the go-for-it show, one person simply grabs the choker, walks down into the draw and wraps the choker around several poles. In the haul-back system, a rope (which can be much smaller diameter than the main-line yet needs to be twice the length of the main-line) wound on the easily turned hand-operated spool bolted to the diagonal support brace of the mast is pulled down into the draw and is fed through a block (the haul-back block) and back uphill to the ground block, with choker attached. It is the turning of the haul-back spool (which has a comfortable handle on the side) that pulls or hauls in rope going through the haul-back block (down in the draw) that hauls the ground block, with choker attached, back down into the draw where poles are ready to be yarded uphill. In the haul-back system, a helper, or choker-setter, in the draw wraps the choker around several poles and the yarding cycle is accomplished quickly. This yarder has been called a “boy toy” by some, but it did complete its grown-up job of yarding about 10 cords of wood. So it is not a toy but a Mini-Skyline Yarder, a scaled-down version (about 1/10 size) of a commercial-size timber yarder. The cost was also small. Because most of the components were borrowed from objects not in use, money to buy things not on hand, such as blocks and carabiner (which cost less than $30), spools, rope, cable, cable clamps, and gasoline and oil was well under $200. That comes to less than $20 a cord. Even if everything had to be bought, the cost per cord would be under $50, half the average cost of $100 a cord for firewood. In the years ahead, continued use of the Mini-Skyline Yarder will make this yarding alternative even more cost-effective. Only a few dollars will be needed to buy gas and oil..
And not only will I be getting firewood to fill an empty woodshed, but this grown-up boywill be enjoying himself hearing the roar of a motor while watching firewood being yarded speedily uphill on a skyline.